Selection: The Church Dogmatics II/2:134-138, Excursus on Supra- and Infralapsarianism (#2). The strength of the supralapsarian position is that the divine decree of election stands at the head of all God’s works, in contrast to the infralapsarian doctrine in which the decree of election is subsumed as it were under the doctrine of providence, following the decree of creation and fall. This view has the effect of placing salvation behind or beneath creation, distinguishing two distinct orders in the divine work. Nevertheless, the infralapsarian position has two advantages. First, the harshness of the supralapsarian position is mitigated somewhat since God elects those who are already and actually fallen; God has not brought humanity into the world in order to fall and so to be damned. Second, this helps avoid the supralapsarian difficulty of making God responsible for the fall and for evil. The Supralapsarians so exalted the sovereignty of God above everything else that they did not sufficiently appreciate the danger of trying to solve the problem of evil and to rationalise the irrational by making it a constituent element in the divine world-order and therefore a necessity, a part of nature (138). Nevertheless, each side is also deficient in some way. As already hinted, the supralapsarian view presents a particularly harsh view of the electing God—“the Supralapsarian God threatens to take on the appearance of a demon” (140). Their error was not their desire to “know” more than could be known, but in seeking to know in the wrong place (135). Barth also finds another problem: by making self-glorification the centre and measure of all things, supralapsarianism could and did prepare for a corresponding movement in which human concerns became the centre and measure of all things (137). The direct link between the divine sovereignty and the individual exacerbated this tendency. There is, no doubt, some degree of irony here, that the emphasis on the absolute sovereignty of God should issue instead in an emphasis on the absolute centrality of the human. Barth sees this development occurring early in Reformed theology: “What vistas open up and what extremes meet at this point! Is it an accident that A. Heidanus, and even so pronounced a disciple of Coccejus as his son-in-law F. Burmann, were at one and the same time Supralapsarians—and also Cartesians?” (137). But the weakness of infralapsarianism is even more concerning. First, although their arguments against supralapsarianism “sound well enough, … they are not the arguments of faith” (135). Their objections are “logico-empirical,” applying to God standards taken from the order of human reason (135-136). But the history of Israel and of Jesus Christ and of the Church is not played out within the framework of a prior and already preceding history of nature and the universe. That is not the picture of the world and history as it is given us in the Bible. According to the Bible, the framework and basis of all temporal occurrence is the history of the covenant between God and man. … It is within this framework that the whole history of nature and the universe plays its specific role, and not the reverse, although logically and empirically the course of things ought to have been the reverse. At this point the Supralapsarians had the courage to draw from the biblical picture of the universe and history the logical deduction in respect of the eternal divine decree. The Infralapsarians did maintain the sequence of the biblical picture in respect of the realisation of salvation, but they shrank from the deduction. In respect of the eternal divine decree they maintained a supposedly more rational order, isolating the two dispensations and subordinating the order of predestination to that of providence. … It was inevitable, then, that the Infralapsarian construction could at least help towards the later cleavage between natural and revealed theology. It is that which (within the framework of the common presuppositions) makes it appear the less happy of the two (136). According to the Supralapsarian opinion man was nothing more than the elect or reprobate in whose whole existence there was only the one prospect of the fulfilment of a course already mapped out either one way or the other. But the Infralapsarians knew of another secret of God side by side with the decree of predestination. Theoretically at least, then, they knew of another secret of man apart from the fact that he is either elect or reprobate. For them man was also (and indeed primarily) the creature of God, and as such responsible to God. This view involved a softening in the understanding of God which is both dangerous and doubtful (137). Thus in his exposition of this theological dispute, Barth finds something to commend on both sides, as well as something to critique. The Supralapsarians rightly emphasise the divine sovereignty and grace but open the possibility of making God responsible for sin and evil, and indeed the whole order of creation being a monstrous economy intending the fall and damnation of multitudes. The Infralapsarians rightly retreat from this position by interposing the decrees of creation and fall in advance of the decree of election though this has the disadvantage of separating the orders of creation and redemption. Interestingly, Barth finds that both sides opened a theoretical possibility which later became actual, of an anthropocentric turn in theology in which humanity became the centre and concern of theology. Selection: The Church Dogmatics II/2:127-134, Excursus on Supra- and Infralapsarianism. Having detailed his theology of Jesus Christ as electing God and elected human, Barth inserts a lengthy excursus surveying the supralapsarian-infralapsarian controversy in Reformed theology from the early seventeenth century. He begins by noting that this was a controversy within the one church that did not disturb or rend the church, but nor was it ultimately settled. He identifies the central question of the controversy: “Is the one elected or rejected homo creabilis et labilis [i.e. humanity to be created and fallible], or is he homo creatus et lapsus [i.e. humanity created and fallen]?” Barth develops his argument in three sections. The first section provides an overview of the two sides of the dispute, plus a mediating position proposed late in the century (127-133). The second section (133-139) analyses what the two sides have in common, as well as the particular strength of each side, together with a suggestion of each side’s weakness. In the third section Barth proposes his own assessment of the controversy (139-145). The whole is an exemplary piece of historical theology and argument. In Barth’s exposition the supralapsarian position is characterised as “a system of consistent theistic monism” (129). It is an audacious and consistent attempt to exalt the divine sovereignty as the rationale and originating cause of all things, and in particular, the eternal destiny of every person, whether to life or to damnation. God’s primal and basic purpose is the divine self-revelation, viz. the glory of his mercy and justice, with creation, the fall, and salvation ordained as means toward this end. The infralapsarian does not think that he has any exact knowledge either of the content of God’s primal and basic plan or of the reasons for the divine decree in respect of creation and fall. On the contrary, he holds that the reasons for this decree are ultimately unknown and unknowable (129). The decree of election is the first and chief of those decrees which relate to the destiny of sinful man, but it is not the first and chief of all the divine decrees. Between creation and the fall on the one hand and salvation on the other there is no necessaria connexio et subordinatio (130). The infralapsarians insist that God’s decree of election concerns actual humanity, created and fallen, rather than a hypothetical humanity with no real existence. Creation and the fall are not the means of election by which God achieves the ultimate aim of self-glorification, but the presupposition of election. Thus the divine decrees which establish creation and allow the fall precede the decree of election. When God set up this fixed system which anticipated the life-history and destiny of every individual as such, then in the same way, in the same sense, with the same emphasis, and in an exact equilibrium in every respect, God uttered both a Yes and a No, accepting some and rejecting others. … The two attitudes together, the one balancing the other, constitute the divine will to self-glorification, and God is glorified equally in the eternal blessedness of the elect and the eternal damnation of the reprobate (134). Finally, both sides understand the divine good pleasure which issues this decree in terms of the decretum absolutum; God’s grace is understood in terms of an absolute freedom whose basis and meaning are completely hidden. Behind both these views (at a different point, but with the same effect in practice), there stands the picture of the absolute God in Himself who is neither conditioned nor self-conditioning, and not the picture of the Son of God who is self-conditioned and therefore conditioned in His union with the Son of David; not the picture of God in Jesus Christ (134). Selection: The Church Dogmatics II/2:122-127, Jesus Christ, Electing and Elected. In his reflections on Jesus as the elected human Barth raises two issues worthy of additional comment. First, he provides a brief glimpse of his theodicy; second, is his portrayal of the prayer of Jesus as the true fulfilment of his creaturely existence. In his discussion of the election of Jesus Christ as suffering, Barth explores the reason for this. God, for the honour of his own name and for the honour of the creature also, will not allow evil and sin, and Satan and his kingdom to overthrow his good work or to have the final word. Rather, in his Son, God determines to confront and conquer this evil. Nevertheless the question must inevitably arise concerning the origin of this evil. Here, Barth insists that “from all eternity judgment has been foreseen” (122). For teleologically the election of the man Jesus carries within itself the election of a creation which is good according to the positive will of God and of man as fashioned after the divine image and foreordained to the divine likeness (reflection). But this involves necessarily the rejection of Satan, the rebel angel who is the very sum and substance of the possibility which is not chosen by God (and which exists only in virtue of this negation); the very essence of the creature in its misunderstanding and misuse of its creation and destiny and in its desire to be as God, to be itself a god. Satan (and the whole kingdom of evil, i.e., the demonic, which has its basis in him) is the shadow which accompanies the light of the election of Jesus Christ (and in him the good creation in which man is in the divine image). And in the divine counsel the shadow itself is necessary as the object of rejection. To the reality of its existence and might and activity (only, of course, in the power of the divine negation, but to that extent grounded in the divine will and counsel) testimony is given by the fall of man, in which man appropriates to himself the satanic desire. When confronted by Satan and his kingdom, man in himself and as such has in his creaturely freedom no power to reject that which in His divine freedom God rejects. Face to face with temptation he cannot maintain the goodness of his creation in the divine image and foreordination to the divine likeness (122). Barth provides an ontological account of the origin and mystery of evil. For Barth, evil arises as that which God does not will. It is the “shadow” cast by the light of what God does will. The mystery of evil emerges as it were almost as a consequence of the divine will. Evil has reality but not substance. The fall also has an ontological basis in the inherent creaturely incapacity to withstand the attraction or temptation of evil. Yet there is also a moral component to the fall: humanity “appropriates to himself the satanic desire” to be a god, and in so doing becomes, like Satan, a rebel. “In himself and as such man will always do as Adam did in Gen. 3” (122). Humanity’s fall, then, is both inevitable and culpable. On account of human culpability it lies under the divine wrath; on account of human weakness, however, it is the object of divine pity. Jesus Christ as the elect human stands in humanity’s place under the divine wrath and for humanity suffers and dies taking their rejection upon himself. Yet Jesus Christ is also the electing God and although subject to the same weakness and incapacity that afflicts the rest of humanity, actually can do and does for humanity what humanity cannot do for itself: resist Satan’s temptation. Why this imposition of the just for the unjust by which in some incomprehensible manner the eternal Judge becomes Himself the judged? Because His justice is a merciful and for this reason a perfect justice. Because the sin of the disobedient is also their need, and even while it affronts Him it also moves Him to pity. … Because in the powerlessness of sinners against Satan He sees their guilt, but in their guilt He sees also their powerlessness. Because He knows quite well that those who had no strength to resist Satan are even less able to bear and suffer the rejection which those who hear Satan and obey him merit together with him. Because from all eternity He knows “whereof we are made” (Psalm 103:14). That is why He intervened on our behalf in His Son (124). That God did this is, of course, due to his own grace in which God elected humanity in his Son. The grace of election is also at once the grace of reconciliation for the same Jesus in whom we are elected is also the Judge who takes the place of the judged. In the One in whom they are elected, that is to say, in the death which the Son of God has died for them, they themselves have died as sinners. And that means their radical sanctification, separation and purification for participation in a true creaturely independence, and more than that, for the divine sonship of the creature which is the grace for which from all eternity they are elected in the election of the man Jesus (125). This sonship, this radical sanctification, this true creaturely independence seen in the steadfastness of the humanity of Jesus, and specifically in his prayer by which he “fulfils His creaturely office” (126). Jesus’ prayer is his intercession with God on behalf of his people. It is the human answer and assent to the will of God as it confronts his own will. It is his affirmation of the divine right in the exercise of holy wrath against human sinfulness to which he submits as victim, even as he is both priest and judge. The election of Jesus Christ, therefore, stands as the pattern for the election of all, for they are elect in him. The mystery of the elected man Jesus is the divine and human steadfastness which is the end of all God’s ways and works and therefore the object and content of the divine predestination. … Being elected “in Him,” they are elected only to believe in Him, i.e., to love in Him the Son of God who died and rose again for them, to laud in Him the priest and victim of their reconciliation with God, to recognise in Him the justification of God (which is also their own justification), to honour in Him their Leader and Representative, their Lord and Head, and the kingdom of God which is a kingdom above all other kingdoms. It is as they love Him and laud Him and recognise Him and honour Him in this way that they can have their own life, their rejection being put behind them and beneath them, rejected with His rejection. To believe in Jesus means to have His resurrection and prayer both in the mind and in the heart. And this means to be elected. For it is the man that does this who “in Him” is the object of the divine election of grace (126-127). Selection: The Church Dogmatics II/2:115-127, Jesus Christ, Electing and Elected. Jesus Christ reveals to us our election as an election which is made by Him, by His will which is also the will of God. He tells us that He Himself is the One who elects us. In the very foreground of our existence in history we can and should cleave wholly and with full assurance to Him because in the eternal background of history, in the beginning with God, the only decree which was passed, the only Word which was spoken and which prevails, was the decision which was executed by Him. As we believe in Him and hear His Word and hold fast by His decision, we can know with a certainty which nothing can ever shake that we are the elect of God (115-116). Jesus Christ, then, is not merely one of the elect but the elect of God. From the very beginning (from eternity itself), as elected man He does not stand alongside the rest of the elect, but before and above them as the One who is originally and properly the Elect. From the very beginning (from eternity itself), there are no other elect together with or apart from Him, but, as Eph. 14 tells us, only “in” Him. “In Him” does not simply mean with Him, together with Him, in His company. Nor does it mean only through Him, by means of that which He as elected man can be and do for them. “In Him” means in His person, in His will, in His own divine choice, in the basic decision of God which He fulfils over against every man. . . . As elected man He is also the electing God, electing them in His own humanity. In that He (as God) wills Himself (as man), He also wills them. . . . His election is the original and all-inclusive election; . . . And for this reason, as elected man He is the Lord and Head of all the elect, the revelation and reflection of their election, and the organ and instrument of all divine electing (116-117). Even in the man Jesus there is indeed no merit, no prior and self-sufficient goodness, which can precede His election to divine sonship. Neither prayer nor the life of faith can command or compel His election. It is by the work of the Word of God, by the Holy Spirit, that He is conceived and born without sin, that He is what He is, the Son of God; by grace alone. And as He became Christ, so we become Christians (118). Barth calls upon Augustine, Thomas, and Calvin, as traditional witnesses who say much the same (118-120). “The election of Jesus Christ is, in fact, the revelation of our election. In His election we can and should recognise our own” (119). Further, Barth speaks of Jesus as the elect human in terms of his mission, of his obedience to the will and works of the Father, of his submission, therefore, to the rule of the Father, and ultimately of his suffering: his election is “election for suffering” (118; cf. 120). Barth cites G. Schrenk: “He is elected man not only in His passion and in spite of His passion, but for His passion” (117). The suffering of Jesus arises on account of the presence and reality of evil into which humanity has fallen. In fact, humanity has become God’s enemy and the object of divine wrath, subject to rejection. As the electing God, Jesus Christ takes the rejection of humanity upon himself—as the elect human, suffering for humanity and in their place. The rejection which all men incurred, the wrath of God under which all men lie, the death which all men must die, God in His love for men transfers from all eternity to Him in whom He loves and elects them, and whom He elects at their head and in their place. God from all eternity ordains this obedient One in order that He might bear the suffering which the disobedient have deserved and which for the sake of God’s righteousness must necessarily be borne. . . . For this reason, He is the Lamb slain, and the Lamb slain from the foundation of the world. For this reason, the crucified Jesus is the “image of the invisible God” (123). From all eternity and to the very depths of his being God loves the human creature that he has created. From all eternity and to the very depths of his being God has demonstrated this love by taking responsibility for the humanity he has created, doing so in the person of the Son who is also “the Lamb slain from the foundation of the world.” Barth’s final sentence in the above citation is worthy of much reflection: “the crucified Jesus is the ‘image of the invisible God.’” To all eternity and to the very depths of his being God is as we see Him here to be in the suffering self-giving love of his Son. Selection: The Church Dogmatics II/2:103-115, Jesus Christ, Electing and Elected. In its simplest and most comprehensive form the dogma of predestination consists, then, in the assertion that the divine predestination is the election of Jesus Christ. But the concept of election has a double reference—to the elector and to the elected (103). It is true that as the Son of God given by the Father to be one with man, and to take to Himself the form of man, He is elected. It is also true that He does not elect alone, but in company with the electing of the Father and the Holy Spirit. But He does elect. The obedience which He renders as the Son of God is, as genuine obedience, His own decision and electing, a decision and electing no less divinely free than the electing and decision of the Father and the Holy Spirit. Even the fact that He is elected corresponds as closely as possible to His own electing. In the harmony of the triune God He is no less the original Subject of this electing than He is its original object. … Of Jesus Christ we know nothing more surely and definitely than this—that in free obedience to His Father He elected to be man, and as man, to do the will of God. If God elects us too, then it is in and with this election of Jesus Christ, in and with this free act of obedience on the part of His Son. … It is in Him that the eternal election becomes immediately and directly the promise of our own election as it is enacted in time, our calling, our summoning to faith, our assent to the divine intervention on our behalf, the revelation of ourselves as the sons of God and of God as our Father, the communication of the Holy Spirit who is none other than the Spirit of this act of obedience, the Spirit of obedience itself, and for us the Spirit of adoption (105-106). In the divine harmony of the eternal will of the Trinity, God determined to be God only in union with humanity in the person of Jesus Christ. The eternal Son of God for his part, was obedient to this divine will, determining himself and being determined for this particular union of God with humanity. His obedience was his own electing—his choosing to be incarnate, to be God-with-us—and his election, his being elected. And in his election we find the only ground of our own election, its promise, and its enacting in time. In the light of these passages the electing of the disciples ascribed to Jesus must be understood not merely as a function undertaken by Him in an instrumental and representative capacity, but rather as an act of divine sovereignty, in which there is seen in a particular way the primal and basic decision of God which is also that of Jesus Christ (106). Second, he engages in historical discussion to argue that Jesus Christ is not simply elected passively, that is, with respect to his human nature, but is also actively the electing One (106-115). Barth’s motive in prosecuting this argument is pastoral, concerned with Christian assurance: if Christ is only the elect and not also electing, then we must look elsewhere than Jesus Christ to find the ground of our election, and indeed will confront only mystery. And of the reality of that mystery we know nothing. We cannot even believe it. In face of it we can only attempt to create the necessary knowledge by constructing a decretum absolutum. In such circumstances predestination is not only a higher something behind and above the covenant effected and revealed in the divine-human person of Jesus Christ. In its very essence it is something quite different from this person. It is a hidden decree which we can never recognise as divine and to which we cannot possibly be required or advised to entrust ourselves (107). if we can be absolutely certain that in Jesus Christ we have to do immediately and directly with the electing God. If this is not the case, we are exposed always to the doubt that in the election we have to do perhaps with the will of a God who has not bound Himself in covenant with us and who is not gracious towards us (108). In this section Barth explores the idea of election found in Thomas Aquinas, and over against Thomas’s view he calls Augustine and, especially, Athanasius. He laments that Athanasius’ insight had no continuing influence and development in the history of theology with respect to this question. The Reformers, too, failed to see that Jesus Christ must be the electing God with the result that all their attempts at spiritual consolation direct us elsewhere than Jesus Christ. How can we have assurance in respect of our own election except by the Word of God? And how can even the Word of God give us assurance on this point if this Word, if Jesus Christ, is not really the electing God, not the election itself, not our election, but only an elected means whereby the electing God—electing elsewhere and in some other way—executes that which He has decreed concerning those whom He has—elsewhere and in some other way—elected? The fact that Calvin in particular not only did not answer but did not even perceive this question is the decisive objection which we have to bring against his whole doctrine of predestination. The electing God of Calvin is a Deus nudus absconditus [“purely hidden God”]. It is not the Deus revelatus who is as such the Deus absconditus, the eternal God. All the dubious features of Calvin’s doctrine result from the basic failing that what was in the beginning with God must be sought elsewhere than in Jesus Christ (111). And the possibility of such a happy inconsistency should not prevent us from recognising this false start for what it was. Nor must it encourage us to perpetuate the error. It must encourage us rather to correct it, replacing the doctrine of the decretum absolutum by that of the Word which was in the beginning with God (113-114). Selection: The Church Dogmatics II/2:94-110, Jesus Christ, Electing and Elected. It is necessary to revisit these pages already treated to attend Barth’s astounding claim that Jesus Christ—the man—was in the beginning with God. How can the man Jesus Christ be in the beginning with God? Is it not more correct to speak of the Son, or of the eternal Logos? As is well known, in the Johannine Prologue the concept recurs only once (v. 14), and in the rest of the Gospel it does not recur at all in this sense. In the presentation as a whole its character is obviously that of a stop-gap. It is a preliminary indication of the place where later something or someone quite different will be disclosed. … In Jn. 11 the reference is very clear: ὁ λόγος is unmistakably substituted for Jesus. His is the place which the predicates attributed to the Logos are meant at once to mark off, to clear and to reserve. … It is the x in an equation whose value we can know only when the equation has been solved. (96, 97). Barth continues his argument by insisting that the meaning of verse 2, “the same was in the beginning with God,” also points forward to the one who fills the position of the Logos: Jesus Christ. “We have no need to project anything into eternity, for at this point eternity is time, i.e., the eternal name has become a temporal name, and the divine name a human. It is of this name that we speak” (98). Jesus Christ, then, is the eternal Son, and Barth finds confirmation of this in a range of New Testament texts (98-99). If this is true, then … in this person we are called upon to recognise the beginning of the Word and decree and election of God, the conclusive and absolute authority in respect of the aim and origin of all things. And this authority we must acknowledge not merely as something which is like God, but as God Himself, since God Himself in all His ways and works willed wholly and utterly to bear this name, and actually does bear it … We are not thinking or speaking rightly of God Himself if we do not take as our starting-point the fact which should be both “first and last”: that from all eternity God elected to bear this name. Over against all that is really outside God, Jesus Christ is the eternal will of God, the eternal decree of God and the eternal beginning of God (99). Jesus Christ is not simply pre-existent in a general or abstract way, but absolutely, as the primal decision of God to be God only in this union with humanity in Jesus Christ. Obviously he is not pre-existent in terms of his flesh, but in anticipation, determined for incarnation. Barth establishes his ground-breaking doctrine of election on his exegesis of this critical text, supported by other New Testament passages, and discussions of the church fathers. His meditation on and exegesis of John 1 is essential to understand his doctrine. Selection: The Church Dogmatics II/2:94-103, Jesus Christ, Electing and Elected. The foundation of election is found in Jesus Christ who is the subject and not merely the instrument or mirror of election. The doctrine is located within the doctrine of God proper, for the election identifies God as the gracious God, gracious in himself and in all his works ad extra. Now, in this new section, Barth turns to the substance of the doctrine. For Barth, Jesus Christ is the divine election of grace, the focus of election, and as such, also the subject and content of election. Jesus Christ is the beginning of all God’s ways ad extra, the ground and telos of all God’s creating, reconciling and redeeming activity. He is the election of God before which and without which and beside which God cannot make any other choices. Before Him and without Him and beside Him God does not, then, elect or will anything (94). In the beginning, before time and space as we know them, before creation, before there was any reality distinct from God which could be the object of the love of God or the setting for His acts of freedom, God anticipated and determined within Himself (in the power of His love and freedom, of His knowing and willing) that the goal and meaning of all His dealings with the as yet non-existent universe should be the fact that in His Son He would be gracious towards man, uniting Himself with him. In the beginning it was the choice of the Father Himself to establish this covenant with man by giving up His Son for him, that He Himself might become man in the fulfilment of His grace. In the beginning it was the choice of the Son to be obedient to grace, and therefore to offer up Himself and to become man in order that this covenant might be made a reality. In the beginning it was the resolve of the Holy Spirit that the unity of God, of the Father and Son should not be disturbed or rent by this covenant with man, but that it should be made the more glorious, the deity of God, the divinity of His love and freedom, being confirmed and demonstrated by this offering of the Father and this self-offering of the Son. This choice was in the beginning. As the subject and object of this choice, Jesus Christ was at the beginning. He was not at the beginning of God, for God has indeed no beginning. But He was at the beginning of all things, at the beginning of God’s dealings with the reality which is distinct from Himself. Jesus Christ was the choice or election of God in respect of this reality. He was the election of God’s grace as directed towards man. He was the election of God’s covenant with man (101-102). Barth’s comments here must be understood in the light of his doctrine of the Trinity in which he distinguishes between the immanent and the economic Trinity, and his model of the Trinity as one divine subject in three modes of being (Church Dogmatics I/1). In this text, God’s triunity precedes his election. God exists and so elects as the eternal Father, Son and Holy Spirit; election is the work of the triune God. Thus the Father elects, the Son elects, the Holy Spirit elects, and yet this is not three electings, but the one divine electing of the triune God. There is in Barth’s theology, no social trinity in which the will of the Father differs from that of the Son and the Spirit after the analogy of three distinct human persons, where the will of the three is utterly distinct from that of the others, and may even be in competition or conflict with the others. There may be distinction in the manner in which this one divine will is expressed in the choice of the three persons, but no division or separation. Barth, of course, goes further than this: Jesus Christ is in the beginning—not in the beginning of God “for God has indeed no beginning. But He was at the beginning of all things, at the beginning of God’s dealings with the reality which is distinct from Himself.” Thus, election concerns not simply “the Son,” but Jesus Christ, the incarnate, the Son of God who is also the Son of Man. But how is this so, given that Jesus Christ is the man born in time? In the eternity of God—that is, in the eternal wisdom and counsel of God, before there was any reality other than the life and being of God as Father, Son and Holy Spirit, God, in the freedom of his love, determined that he would give himself to and unite himself with humanity in the person of Jesus Christ. Before anything else this is a divine self-determination, a reflexive action in which God determines God’s own eternal being to be God only in this way, as the One who is with humanity and gracious to humanity in the person of his Son. Jesus Christ, then, is the object and “result” of the divine electing. But Barth will go one step more. Not only is Jesus Christ the object of the divine election, but because this is an act of divine self-determination, the Son who chooses this electing together with the Father and the Spirit is none other than the Son united with humanity in the person of Jesus Christ. Jesus Christ, then, is the subject of election, the one who elects, as well as the object of election, the one who is elected. Selection: The Church Dogmatics II/2:76-93, The Place of the Doctrine in Dogmatics. The final subsection of §32 concerns the location of the doctrine in the schema of systematic theology. Barth innovates with respect to the tradition by situating the doctrine of election within the doctrine of God; God himself and all God’s works are a consequence of his election. God is God only as the electing God. As far as I know, no previous dogmatician has adopted such a course. We must ask then: Is it really the case that the doctrine of election forms a part of the definition of the Subject of all Christian doctrine? … We answer this question affirmatively when we maintain of God that in Himself, in the primal and basic decision in which he wills to be and actually is God, in the mystery of what takes place from and to all eternity within Himself, within His triune being, God is none other than the One who in His Son or Word elects Himself, and in and with Himself elects His people. In so far as God not only is love, but loves, in the act of love which determines His whole being God elects (76). In this subsection Barth surveys six different ways in which theologians have located the doctrine, especially within the Reformed tradition, and more particularly with reference to Calvin. 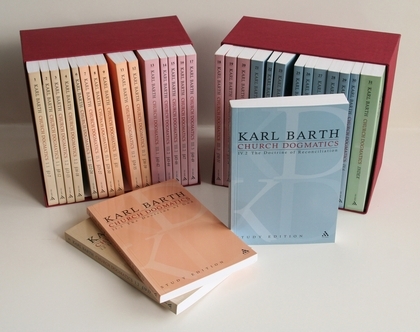 In classical Reformed Orthodoxy, according to Barth, the doctrine followed the doctrine of God, preceding directly the doctrine of creation and the whole remaining content of confession and dogmatics (77). Nevertheless Barth distinguishes his own position from that of Reformed Orthodoxy because the primary tenet of the tradition was not election at all, but the doctrine of the divine decrees of which the election was simply one part. The election, therefore, was grounded in a doctrine of the “absolute world-governance of God,” thus taking God in his relation to the world as its first datum, and understanding the election in light of this (78). As Barth turns his attention to other ways of considering the location of election he notes that they all speak first of creation and providence and only then of election, either in connection with providence, or with respect to God’s work of salvation. The most interesting feature of this section is Barth’s discussion of Calvin. Barth notes that in 1536 in the first edition of his Institutes, Calvin linked the doctrine of election with ecclesiology rather than subsuming it under the doctrine of providence. A year later in the first draft of his Catechism, Calvin placed the doctrine immediately after his treatment of Christology and before his treatment of the Holy Spirit and the church. In the later editions of his Institutes (from 1539-1559), it is treated as the climax of reconciliation, as the last word to be spoken concerning God’s work of salvation, which also casts its light on all that has gone before. Finally, in the Confession Gallicana (1559), Calvin adopted precisely the opposite arrangement in which the election was the first word to be spoken with respect to reconciliation. It is true that Calvin did partly share and partly inaugurate four different conceptions of the place and function of the doctrine of election. But it is also true that we do not find amongst these the conception which is usually described as classical in Reformed dogmatics. Calvin never connected the doctrine of predestination with that of God, whether directly or indirectly (86). What Calvin did appear to find in the doctrine of election was this—a final (and therefore a first) word on the whole reality of the Christian life, the word which tells us that the existence and the continuance and the future of that life are wholly and utterly of the free grace of God (86). Of the four proposals made by Calvin, Barth considers that of his Catechism the best, since it understands election as “an event which works itself out between Christ and the Christian” (88). The doctrine of election is the last or first or central word in the whole doctrine of reconciliation as [Calvin] rightly perceive[d]. But the doctrine of reconciliation is itself the first or last or central word in the whole Christian confession or the whole of Christian dogma. Dogmatics has no more exalted or profound word—essentially, indeed, it has no other word—than this: that God was in Christ reconciling the world unto himself (88). We must see the election at the beginning of all the ways of God, and treat of the doctrine accordingly. We believe that in so doing we shall not be disloyal to the intention which activated Calvin especially as he drew up those different outlines. We shall rather be taking up and realising this very same intention (90). Selection: The Church Dogmatics II/2:51-63, The Foundation of the Doctrine. Of the four possible foundations for the doctrine of election detailed thus far, the final two excite Barth’s interest for in their own way they identify—inadequately to be sure—the elected man and the electing God. “Because of their incorrect form we must reject them as answers to the question of the basis of the doctrine, but we must keep their substance in so far as it indicates the two poles of the problem, God on the one side and man on the other” (52). It is the name of Jesus Christ which, according to the divine self-revelation, forms the focus at which the two decisive beams of the truth forced upon us converge and unite: on the one hand the electing God and on the other elected man. It is to this name, then, that all Christian teaching of this truth must look, from this name that it must derive, and to this name that it must strive (59). If we would know who God is, and what is the meaning and purpose of His election, and in what respect He is the electing God, then we must look away from all others, and excluding all side glances or secondary thoughts, we must look only upon and to the name of Jesus Christ, and the existence and history of the people of God enclosed within Him (54; cf. 58-59). To ground the doctrine of election and to speak of elected humanity, Barth turns to the Old Testament, using a narrative and typological approach which shows God’s electing work as God continually narrows his choice from amongst all people to the particular person who is the elect—Jesus Christ. His treatment moves from Adam to Jacob to David to Jeconiah to Zerubbabel and finally to Jesus; four movements in the Old Testament in which each individual named is intended to function as a witness to Jesus Christ who is the fulfilment both of God’s judgement and the promise of God’s grace (55-58). The Word—that Word which created Israel, and accompanied and directed it as prophetic judge and comforter—the Word itself became flesh. The Word Himself became the Son of David. Now at last there had come the special case for which there had had to be all those others from Adam to Zerubbabel, and for which Israel had had to be separated out from the whole race, and Judah from Israel. This coming was to the detriment of Israel. Face to face with its Messiah, the Son of David who was also the Son of God, Israel knew no better than to give Him up to the Gentiles to be put to death on the cross. In so doing, they confirmed the rightness of God’s dealings with them from the very first, when He cut them off and destroyed them. And yet because the righteousness of God stands fast like the mountains against the unrighteousness of man, this coming was also to the benefit of Israel, and of the Gentiles, and of the world. In the crucifixion of Jesus Christ the world was shown to be a co-partner in guilt with Israel, but only in order that it might be shown a co-partner in the promise with Israel. … Jews and Gentiles were in the same guilt of disobedience. But now they could hear the same words: You, my people; I, God, in the person of David’s Son, your King. Those who are called by this King, and hear this King, whether they are Jews or Gentiles, constitute the people whose existence was envisaged throughout the whole of that long history (57-58). The elect must look always to Jesus Christ in matters of the election because whoever is elected is elected in Christ and only Christ. But if this is so, then it is settled conclusively that no one can ever seek the basis of election in himself, because no one is ever elected in himself or for the sake of himself or finally of himself. … It is not in man himself or in the work of man that the basis of election must be sought. It is in this other person who is the person of God himself in the flesh. It is in the work of this other person: a work which comes to man and comes upon man from without; a work which is quite different from anything that he himself is or does. Man and his decision follow the decision which is already made before him, without him and against him; the decision which is not made in himself at all, but is made concerning him in this wholly other person. And as he recognises this, he recognises in truth the meaning and nature of the divine election: that it is the essence of divine favour. He recognises, too, the meaning and nature of the doctrine of election: that it is the sum of the gospel (62-63). This section is of particular interest, not only because Barth pre-empts his later discussion of Arminianism. His biblical orientation and hermeneutics are on clear display in his discussion of the Old Testament, and in his interaction with and extensive citation of the Reformers Barth skilfully identifies the main lines of the tradition, affirming where he can and also setting the framework for the critical question and observation he will go on to make. Selection: The Church Dogmatics II/2:44-51, The Foundation of the Doctrine. Barth names the fourth inadequate foundation for the doctrine of election as a doctrine which begins with a view of God in terms of omnipotent will. God is wrongly conceived if viewed as absolute power, and God’s election is also wrongly conceived if viewed as a sub-set of a thorough-going determinism in which God is viewed as the almighty causative agent of every happening. Certainly, for Barth, God is almighty but God’s divinity is not considered in abstraction from election. Indeed, his election is the context within which we conceive of his divinity and providence. The god of absolute power is not the God of Scripture (44-45). Barth identifies the tendency to subordinate election as one moment in an overarching providence in Thomas Aquinas, Bonaventura, and Zwingli. It is to Calvin’s credit that he broke with this tradition, treating providence together with creation, and predestination as the climax of the grace of God revealed and active in Jesus Christ. However, “that predestination should not only be subordinate to providence but superior to it was apparently not what Calvin intended” (46). Thus, Calvin’s followers again returned to the former tradition in which the ruling concept of the doctrine of election became once more, that of an “absolutely free divine disposing” (46). Barth cites extensively from the recently published volume by Boettner to show the contemporary continuation of this approach, which he attributes to Gomarus rather than Calvin (47). Barth rejects this approach: “latet periculum in generalibus” (‘danger lurks in generalities!’; 48). Once again we must say that use has been made here of a presupposition which is not so self-evident as it makes itself out to be. Recourse has been had here to an apparent movement in formal logic from the general to the particular, without any demonstration whether or not such a procedure corresponds to the specific logic of this subject. … If [the doctrine of election] is grounded upon the logical necessity of the free and omnipotent divine will active both in general matters and in particular, both in the world as a whole and also in relation to the salvation and damnation of man, this means that it is…abstractly grounded so far as concerns the electing God (48). The true God is the One whose freedom and love have nothing to do with abstract absoluteness or naked sovereignty, but who in His love and freedom has determined and limited Himself to be God in particular and not in general, and only as such to be omnipotent and sovereign and the possessor of all other perfections (49). If God is viewed abstractly in terms of absolute power and omnipotent will, not only is he viewed in a manner distinct from his self-revelation and the testimony of Scripture (49), it is difficult to escape the danger of portraying God as a tyrant, and of understanding his rule as that of absolute caprice (50-51). Infinite power in an infinite sphere is rather the characteristic of the government of ungodly and anti-godly courts. God Himself rules in a definite sphere and with a definite power. What makes Him the divine Ruler is the very fact that His rule is determined and limited: self-determined and self-limited, but determined and limited none the less; and not in the sense that His caprice as such constitutes His divine being and therefore the principle of His world-government, but in such a way that He has concretely determined and limited Himself after the manner of a true king (and not of a tyrant); in such a way, then, that we can never expect any decisions from God except those which rest upon this concrete determination and limitation of His being, upon this primal decision made in His eternal being; decisions, then, which are always in direct line with this primal decision, and not somewhere to right or lift of it in an infinite sphere (50). It is impossible to read these comments written in the early 1940s without hearing veiled references to the absolutist tyranny of Hitler’s Third Reich. Although God is indeed Almighty, his rule is not to be confused with the absolutist pretensions that marked Hitler’s rule. In the decision of election God has determined his being to be God only in a particular way.